“Will Ford impressed me with his confidence, intelligence and knowledge of politics,” says Andrew Bayly. Photo supplied. Aspiring politician Will Ford will get a real taste of life as an MP when he goes to Parliament next year. 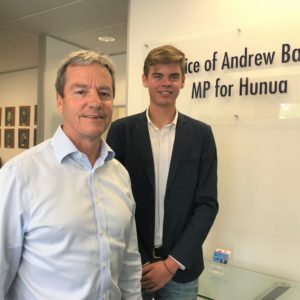 The 17-year-old has been selected as Youth MP for the Hunua electorate at Youth Parliament 2019. MP Andrew Bayly picked Will after a rigorous selection process that involved a diverse group of students from the electorate. “I was impressed by the calibre of the candidates who applied. We have some outstanding young people in the electorate and it was a tough job having to pick only one person,” says Bayly. The Year 12 student is planning to study law at university with the ultimate goal of moving into politics. He was stunned when he heard the news that he’d been selected, he says. Will says his interest in politics is relatively new and was confirmed when he became part of a mooting team that won the Waikato National Secondary Schools’ Mooting Competition. In mooting, two opposing teams of ‘lawyers’ argue a legal case before a judge based on the facts of a problem. Will says he enjoyed the process and the competition. And he thinks those skills will come in handy when he attends Youth Parliament. The six-month programme begins on March 1 when Will’s training as a Youth MP starts. It will help him understand his role and prepare him for Wellington. He will join 119 other Youth MPs on July 16-17 to learn about the government decision-making process and share their views of New Zealand youth alongside the country’s leaders. They will sit on select committees, ask questions of ministers and debate legislation in the House. Will has to submit potential topics to be discussed, deliver projects and connect with young people in the electorate to make sure he understands their views. Some of the issues he’s already identified an interest in exploring include addressing mental health problems in schools, and improving education systems and NCEA standards to make our students more competitive internationally. He says he’s really looking forward to being involved and trying his best to represent the views of young people in the electorate.